A collection of popular Portuguese recipes from mainland Portugal, the Azores, Madeira and around the world. This popular Portuguese shrimp patties recipe (receita de rissóis de camarão) make a great, delicious and creamy appetizer. Bring the shrimp to a boil in about 1 liter of water and season with salt. Let it cook for about 3 minutes. Drain the shrimp and reserve/put aside the broth. Peel the shrimp and chop about 10 of them. In a pan, heat the margarine with the onion and stir until the onion begins to brown. Add the flour, stir well and add the shrimp broth and milk gradually, stirring constantly. Then add the tomato paste and chopped shrimp. Season with a few drops of lemon, pepper and nutmeg. Add the remaining shrimp and chopped parsley. When bubbling, remove and allow it to cool. In a pan, heat the water, margarine, lemon peel and salt. When it is boiling remove the lemon peel, add the flour, stir until it doesn't stick to the pan and remove from the heat. Place the dough on a workbench sprinkled with flour and let it cool slightly. After cooling slightly, use the dough roller to extend it thinly. In half of the dough, spread spoonfulls of the filling on top. Fold the dough over it and cut the patties with the help of a glass cup. Pass them through the beaten eggs and breadcrumbs and fry them in hot oil. Once fried, place them in paper towels. 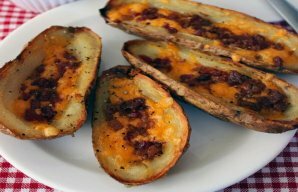 These Portuguese style potato skins are stuffed with linguiça and cheese, they are crispy, tasty and delightful. 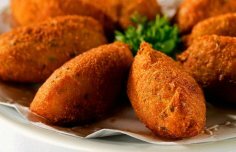 How to make Portuguese cod fritters (pasteis de bacalhau). 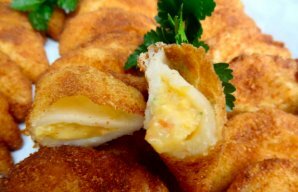 These Portuguese shrimp rissois (turnovers) are incredible and worth the time and effort, thanks to Tia Maria's blog for the recipe.